Regularization of cargo if HAWB/HBL number missing on parcel. 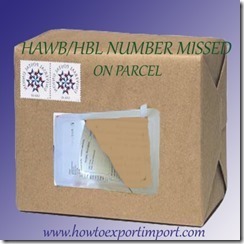 Can an imported goods be delivered to consignee if HAWB/HBL number wrong on the parcel? In this article, let me explain about one of the problems and solutions faces in delivery of import goods at final port of destination. This issue is related to delivery of imported goods at a destination customs location and the custodian of goods at the location. How to take delivery of imported goods, if HAWB/HBL number missed on parcel or HAWB/HBL number is wrong on parcel? Here, the importer or his agent has to arrange for regularization of cargo by obtaining permission from customs department and custodian of imported goods. First, let us know the procedures and formalities of taking delivery of imported goods at a destination port customs location. The shipper obtains House Airway Bill (HAWB) or House bill of Lading from freight forwarder on delivery of goods after completing necessary export customs formalities. If cargo is booked by sea under Less Container Load (LCL), the HBL number has to be mentioned on the package and if by air, House Airway Bill number. Once after arrival of goods at destination customs port, the main carrier files Import General Manifest and the freight forwarder files consol IGM with customs. The importer or his agent completes import customs formalities by filing necessary documents after filing IGM by carrier of imported goods. The importer collects delivery order under said import shipment from freight forwarder. Once import customs clearance procedures completed, he approaches custodian of cargo to deliver goods by producing necessary customs cleared documents along with the delivery order issued by freight forwarder. The custodian of cargo verifies the documents and delivers cargo to consignee by confirming the HAWB/HBL number and MAWB/MBL NUMBER and other marks and numbers mentioned on the parcel. Here the question is, if the HAWB/HBL number is not available on parcel, how can a custodian verify and confirms the ownership of goods? So if HAWB or HBL number is missing on the parcel how to take import delivery of goods? Who should give permission for delivery of goods, if no HBL or HAWB on parcel? As I have mentioned in other articles, the cargo is under the control of customs, carrier and custodian. Now custodian wants to confirm the ownership of cargo. So, the consignee or his agent has to get permission from customs and freight forwarder. Also the importer or his agent has to obtain permission from the authority of custodian. So, the importer or his agent gets a declaration on such missing from freight forwarder, requesting customs and custodian of cargo separately to release the cargo to the said consignee. Along with the freight forwarder’s letter, consignee or his agent obtains permission from customs department. Customs permits the request after confirming by necessary physical verification of cargo wherever applicable. The importer or his agent applies for delivery of cargo along with the permission copy issued by customs in this regard and obtains permission from custodian of cargo and take delivery of cargo. In this article, I have explained about import delivery of goods if HAWB/HBL number wrong /missed on import packages. Had you experienced this type of hassles at destination port location when taking delivery of imported goods? Share below your experience in handling such situation when HAWB/HBL number lost /mistake on imported packages at destination port customs location. 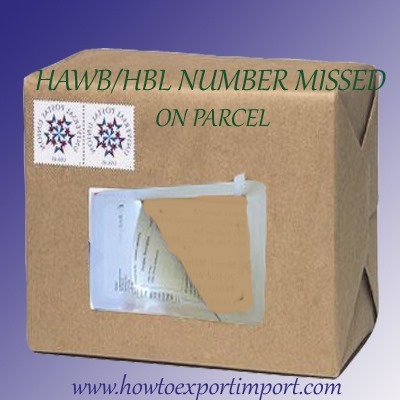 Do you wish to add more information on this subject about change of HAWB/HBL number on parcel which delayed delivery of imported goods? Did you like this article about import delivery delay due to change of HAWB/HBL number on imported package parcel? Comment below your thoughts about this subject – How to take delivery of imported goods, if HAWB/HBL number wrong /missed out on parcel? What are the GST related taxes in India charged on goods and services?